NOW AVAILABLE IN "14" FRAGRANCES ! 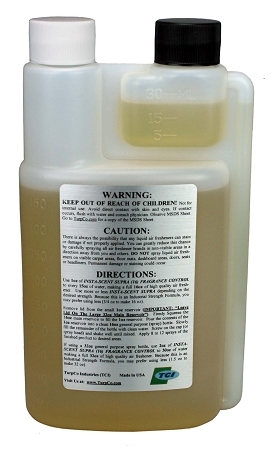 "16oz" of Industrial Strength Air Freshener Concentrate - Formulated for Quick and Easy Blending. Puts You In Charge of Fragrance Control. No More Guess Work - Get the Same Measured Potency Each and Every Time. 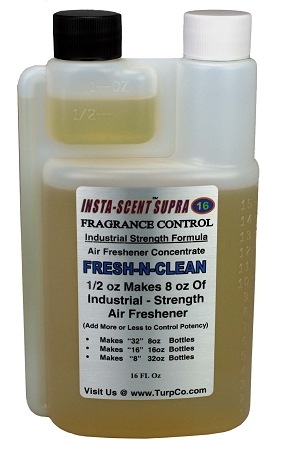 1/2oz Makes An 8oz Spray Bottle of Industrial Strength Air Freshener - Add More or Less for Fragrance Control. Add 1/2oz to 8oz Bottle & Fill With Water - Makes "32 Bottles"
Add 1oz to 16oz Bottle & Fill With Water - Makes "16 Bottles"
Add 2oz to 32oz Bottle & Fill With Water - Makes "8 Bottles"
Insta-Scent Supra, is Super ! We started using Insta-Scent Supra for the first time in our business, and it is the most convenient application design we've ever used. No more mixing large gallons of air freshener, we just load up an ounce, pour into our 16oz bottle, fill with water and shake. Thanks for a long awaited design! Q: Can i use on my oil burner in the house? A: Insta-Scent is formulated to be diluted with water, and used as a spray air freshener. We do not recommend using the product for other purposes. It has not been formulated or tested to be used in oil burning applications. Q: What is the proper way to use this bottle? A: Remove the Black lid from the small 1oz reservoir (IMPORTANT: leave the White lid on the large 32oz main reservoir). Firmly Squeeze the main 16oz reservoir to fill up the 1oz reservoir. Pour the contents of the 1oz reservoir into a clean 16oz general purpose spray bottle that has already been filled 3/4 full with Water. Screw the Black Lid tightly back on the Insta-Scent Supra 1oz reservoir. Finish filling the 16oz general purpose spray bottle with clean water, screw on spray head and shake until mixed well. If you're using a 32oz general purpose spray bottle, add 2oz of Insta-Scent Supra. IMPORTANT: fill the general purpose spray bottle with water first, leaving enough room for the 1oz of Insta-Scent Supra). Apply 8 to 12 sprays of the finished product to desired areas.